A variety of flowering trees with orange blossoms grow in Florida, both native and introduced. Some, such as the hornbeam, produced tiny ,almost insignificant flowers, while others, such as the geiger tree, are prolific in their display. They come in a variety of forms as well, from simple to complex and from single blossoms to large sprays that can cover the entire canopy of trees. Royal Poinciana (Delonix regia) is a large spreading tree that grows to about 40 feet tall and can spread up to 60 feet wide. It is an excellent shade tree and is well known in Florida for its prolific display of reddish-orange blossoms that cover the top of the tree in the late spring and early summer. The African tulip tree (Spathodea campanulata) grows to 60 feet tall. It has 1 1/2-foot-long, compound, evergreen leaves. Each leaf is composed of several 4-inch leaflets. The tree also produces beautiful orange blooms in clusters that can be more than a foot in diameter. The flowers commonly occur in the winter and early spring. Originally from Northern Australia, red silk cotton trees (Bombax ceiba) produce tall, spiny, oddly rough trunks and large, lobed leaves. The canopy of the tree is open and coarse in texture. The blossoms form as large buds that eventually open to produce spectacular, five-petaled, orange-red blossoms. 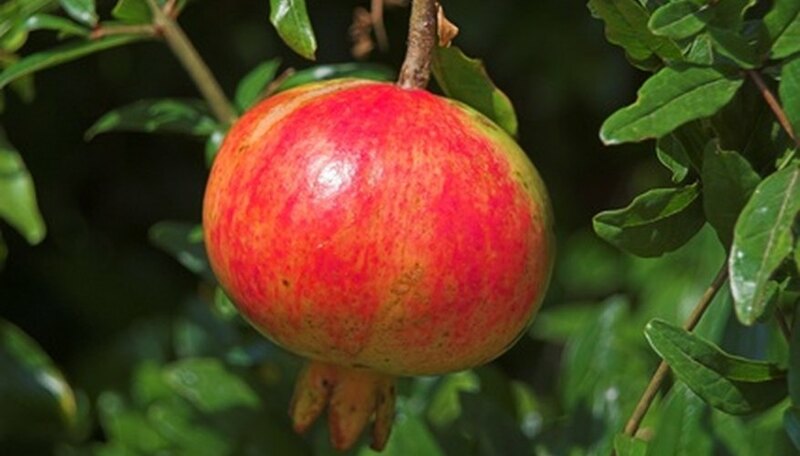 Grown primarily for its beautiful and tart red fruit, the pomegranate (Punica granatum L.) also produces attractive flowers. The blossoms are orange and appear in large clusters at the ends of branches on the tree. Each flower is slightly trumpet-shaped with a whorl of frilly petals at the end. American hornbeam (Carpinus caroliniana) grows in a pyramidal form to around 30 feet tall and is indigenous to much of the United States. It produces inconspicuous orange flowers that form in small, long clusters that hang from the branches of the tree in the spring. The geiger tree (Cordia sebestena) can grow to 25 feet tall with stiff, green, rough leaves that can grow to 7 inches long. The tree also produces showy, trumpet-shaped, orange flowers in the spring and summer. Each blossom is rimmed with six petals. Vera wood (Bulnesia arborea) is an evergreen tree that can grow to 40 feet, producing an impressive canopy. The leaves of the tree are compound with 12 to 24 leaflets each. Vera wood blossoms form across the top of the tree and are yellowish-orange in color, with five distinct petals each. The plant was originally introduced to the United States from Venezuela. Jamaican rain trees (Brya ebenus) are from the West Indies. They produce oval-shaped leaves that can grow to 3 inches in length. The creamy orange to yellow orange, pea-flower blossoms are produced in large cascading clusters. The tree blooms sporadically throughout the year, but tends to flower best during times of high humidity. Originally from Indonesia and India, the orange champaca tree (Michelia champaca) can grow to 20 feet tall with glossy oval leaves. The blossoms are creamy orange in color with long petals which are extremely fragrant and have a very pleasant aroma. The extract from the flowers is a significant ingredient of the perfume Joy. Flame of the forest (Butea frondosa) produces deep orange blossoms in clusters. Each flower resembles a very large pea blossom. The trunk will become twisted over time, adding visual interest to the tree. The plant is slow growing and may take 50 years to reach its full height of 20 feet.